I spent 2 days trying out new cleats on my bike shoes. I was long overdue. I couldn't get the cleats to fit right. First my knee would be popping, so I'd stop and adjust my shoe. Then my ankle would feel twisty. Stop, adjust again, and something else would be out of whack. My bike was being shipped out in 2 days and it was essentially un-ridable. If my legs hurt after 3 miles, what would happen after 112? I made my standard panic calls to Jon and Gerald asking them about shoe fittings. They basically both said that I probably picked up bad habits with the old cleats, and that the new ones were probably fine but that I just had to let my legs "learn" the new fit. That seemed like a big risk. "Maybe" I could adapt to the new cleats in 1 week- I took the pedals off my race bike so I could use them on my old bike, thinking I could practice with them for an extra week before I flew out. But then I had a crazy thought: if my new pedals were causing me problems, why not play it safe and just go back to my old pedals? It's kind of scary/funny: when I took the new cleats back off and compared them to my old ones, I actually thought they were two different models. The old ones had been worn down so much that they were about half as thick as the new ones. I wanted to install my old cleats in exactly the same position they were in before. First I had to figure out which cleat went with which shoe. That was easy: I use a lot of Carbo-pro mixed with Hawaiian Punch on my rides, and it always splatters on the same side of my bike. One of my shoes had red stains on it; one of my cleats had red stains on it. A match. The washers were pretty much molded into the plastic, so they were locked in place. And there was so much wear on them that it was very easy to see exactly where the bolts used to be. It was a very simple repair. It still felt a little funny to ride my bike, but I think that's because I truly "injured" my leg with the old cleats. (I don't want to exaggerate the pain, it was more discomfort than anything, but it was very noticeable for two straight days.) I think I'm good to go, although I did notice an actual crack in one of my old cleats. There is a non-zero chance that it will explode at some point during the race in Hawaii, so as a precaution I will be one of the very few riders with a spare set of cleats with me on the course. I thought this would be a good way to just throw around random thoughts about my Kona training without stressing about having to write up full stories about everything. The way Twitter works, people start to follow you and you get to follow them, and what do you know- some of the biggest names in Ironman are tweeting! I should follow them to see what they're up to! Right now, I don't need to hear about Macca's 7500 feet of climbing and his 4 mile swim. I don't want to know that Chris Lieto is already in Kona- OMG, am I late?! Should I be there by now?! Michael Lovato made the podium at the Branson 70.3; good for him but that doesn't help me. I felt a connection with the other competitors in Coeur d'Alene and Wisconsin. Obviously I knew some of them personally, but I also followed blogs of other "normal people" talking about their training leading up the race. I could identify with them. But Kona? I read these tweets and press releases and I feel like I'm not even in the same race. Even the non-pros: these are not my people. The only online presence of anyone I can remotely relate to is "Dale Tweedy" who won a lottery slot in 2008 and blogged about his experience. That's it. I've had one smug feel-good moment on twitter. Chris Lieto tweeted: "Heading out for a run in the heat. 91f is good enough for heat test, right?" Lemme talk to you about heat. I slept in most weekends this summer, scheduling my runs so that regardless of distance, they would usually end around noon. 2-hour run? 10-noon. 4-hour run? 8-noon. Many if not most of those runs were in the mid-to-upper 90s by the time I finished. Some broke 100. You want to say Hawaii is more humid than L.A.? Fine. I spent 9 days in North Carolina and ran 10 miles with a heat index of 105. Also had an 18-miler out there. You may think that I'm trying to make it sound like I trained in tougher conditions than Chris Lieto. And you know what? At times I did. Maybe I didn't swim and bike and run as much as everyone else but what I did do, I did in the heat. I need this ONE thing to make me feel like my training is somewhat comparable to what everyone else seems to be doing. Please don't take it away from me. So I feel like everything is falling apart. Sometimes literally. I've needed new cleats for my bike shoes for a really long time. These are the first cleats I bought 6 years ago, and they've spent a lot of time clipping in and clipping out and scuffling through parking lots. I knew 3 months ago I should replace my cleats. I knew 6 months ago. I knew a year ago. But I waited until 3 days before I ship my bike of to Hawaii to swap them out. It's very important to fit the cleats to your shoes properly. So I was meticulous with marking the exact position of the screws on each shoe. I wrapped scotch tape around the shoes and carefully marked the center of each of screw from every angle. Then I removed the cleats. And there's another strange thing: I brought my bike in for a complete strip-down/rebuild tune-up, and it felt great afterwards. Except for one little thing: I feel like I'm always leaning to the left. I can't explain it. If I look at the bike, everything looks normal and even and balanced but when I'm riding, I feel ever-so-slightly twisted. Maybe I'm physically asymmetrical and when I had my bike-fitting last year, the guy compensated for it and these new people didn't put the bike back in the exact same configuration. I don't know, it's just weird. In 3 days I am shipping my bike to Hawaii and it doesn't feel like my bike. Great. A couple weeks ago, a rep from one of the big wetsuit companies sent our tri-team an invitation to pre-order one of their brand-new Kona-legal speedsuit. Team Captain Robert passed it along to me and for some reason it got me all excited about getting a speedsuit. I wasn't entirely convinced that I needed a speedsuit in the first place, so I emailed British Stuart (IMoo brother). He has done Kona before and will be there again this year. Basically I wanted to know what everyone else will be wearing. I figure I'll be drawing enough attention to myself with the way my arms are flailing around in the water, and I didn't want to stand out on shore being the only person wearing a tri-top. Basically, Stuart said that pretty much everyone will be wearing the speedsuits so now I knew I needed to get one too. Now there was no reason I had to get THIS specific speedsuit, and Steve suggested I get a cheaper one, but I think I got caught up in the "hurry now! limited time exclusive special!" hype. I placed my order. It's important to note that on the order form it said "Your speedsuit will be shipped to arrive on or before September 30th." That's important. That's a week-and-a-half before the race which is not a lot of time to try out a new suit, but I could get at LEAST 5-6 swims in before the race. 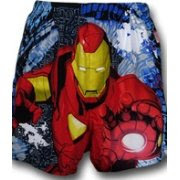 Well today I got a message from them saying "um, yeah, we're not sure we can get the suit to you before the 30th. Can you just pick it up Wednesday in Kona, 3 days before the race?" And I'm like, "um, no... I'm supposed to be relaxing 3 days before the race, not worrying about how a brand new suit is going to fit in the water." I'm also a little annoyed because it is a pretty expensive suit and had I known they weren't going to honor the delivery guarantee, I could have ordered a much cheaper one and probably have it already. I KNOW I am going to hate wearing the speedsuit. If I had 2 weeks, I could at least get somewhat used to it. But as it stands now, I'll probably just get one or two test swims with it before race day. What could possibly go wrong? OK, OK. 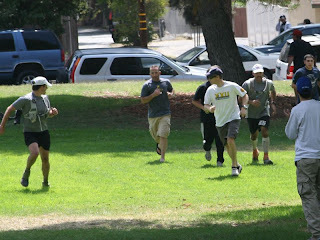 The race photos are in and they clearly show that I finished the race exactly when the chip said I did. So it was in fact my slowest Malibu race ever. I still had a good bike and had a decent run in spite of a pee break, but the swim was just terrible. I know it doesn't matter - this race wasn't even on my radar in terms of training - but it would have been a nice affirmation of my Ironman training to do well in a sprint race. I got one good photo from the day: check out these wheels going to Kona- and I'm not talking about the bike! Booyah! Yes, that's an email I got from IronSteph today. 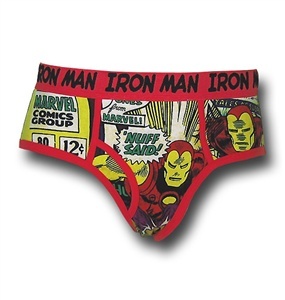 As if I didn't have enough to worry about, Steve had to share this clip of the Ironman Underpants Run. Basically, the Thursday before Kona about 500 people gather in their underwear for a 1-mile run. Oh. My. God. This could be huge. HUGE!. My posted time was 20:20. In my 4 previous races, I've done 14:50-18:07. So it is a little odd that I would be 2 minutes slower than my slowest swim. Odd, but not impossible. I was very cold and had not practiced at all in my wetsuit. On the other hand, the water was very calm compared with other years and it did not feel like a long swim to me. But I really have no sense as to what a 15 minute swim vs. a 20 minute swim feels like. (Bear with me, there will be some math) I was wearing a watch, but I did not check my time coming out of the water. I do have some interesting data points though. My watch was about 1 minute slower than the official race start times: my wave was supposed to go off at 7:40 and the last time I checked my watch it said 7:41. I checked my watch again as I started to wheel my bike out of the transition area and I THINK it said 8:02. My posted T1 time was 5:17. That's not good, but that's very typical for me. Now then, if I had a 20-minute swim, in order for me to be leaving transition at 8:02 that would mean I had a 2-minute T1 time. Come on now, seriously? I'm a spaz in transition. I can barely put my helmet on in 2 minutes. Let's suppose my watch-start-time was actually 7:41:30. After a 15:20 swim I'd arrive in T1 at 7:56:50. After 5:17, It would be 8:02:07. The math works. But I can't absolutely rule out the possibility that maybe I actually checked my watch while I was still getting out of my wetsuit and was in transition for a few minutes after that. I am 99% sure that wasn't the case though. I will call the race-timing officials tomorrow. If they can look up on the computer and tell me that Men 40-44 started at 7:40 and my chip started at 7:35, then I know there was an error and I will have them adjust the time. But if they can't verify the early start then I'm not comfortable with requesting a change in the official results. Hopefully it will not be an issue. I had a very floppy race today. More on that later. For starters, let me say that this happens to me every year in Malibu: I do the race and I think to myself "hey, that went pretty well!" Then I find out my actual time and realize that I was slower than previous years. 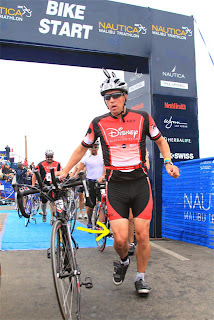 This was my slowest Malibu race ever, at least until next year when it seems I will be even slower. The most important part of the race - getting to the port-a-potties in the morning- went very smoothly. I went through the line 3 times before the race start, so that was good. But the strange thing is that after I put on my wetsuit and went down to the beach I had to pee. Kind of badly. All I had to drink that morning was a half-bottle of water with breakfast (a single Powerbar) and a sip of Mountain Dew (thanks to Mr. Pusateri who picked up some Dew during a coffee run.) During the "warm-up" in the water (and I use the term loosely because the water was 58 degrees) I thought for a moment I'd try to go in my wetsuit but I just couldn't figure out how to do it. Too much pressure. So I just figured I would deal with it later. I wasn't happy in the swim. I had not been swimming in a wetsuit since Ironman Wisconsin exactly one year ago, and I was feeling very confined by the suit. I'm sure it was 75% psychological, but between the suit and the cold water I felt like I was having trouble breathing. And I knew I was swimming poorly. I remember thinking "well, this isn't the correct form Steve told me to do" and I just didn't care. It just felt more comfortable to flail my arms around than to try to stretch against the suit and try to swim properly. My swim times over the past 5 races: 15 minutes, 16 minutes, 17, 18, and then 20 minutes today. Notice a trend? I had a 5:17 transition time. That's pretty average for me. I should have done a little better, but both feet got tangled up in my wetsuit and I was a little dizzy. And I really had to pee. But there are no port-a-potties in the transition area so I figured I would just deal with it later. I felt I was pretty aggressive on the bike. Malibu has some rolling hills to deal with and my chain has been falling off a lot lately so I was very careful about all of my gear shifting and everything held together. My final bike time was over a minute better than my fastest previous bike time. I averaged 20mph and and was in the top 12% overall so I feel pretty good about that. (I should HOPE that my bike has improved!) The two things I was most ware of during the bike was that 1) I could not feel my toes and 2) I really needed to pee. 1:49 Transition time, I'm completely fine with that. Have I mentioned that I really had to pee? Here was my dilemma now. There are many bathrooms along the run course, but most of them are maybe 50-100 feet off the path. That may not sound far, but it's only a 4-mile run so an extra 15 seconds or so can make a difference. I figured that the closest bathroom to the run course was about 1.5 miles in, when we leave the parking lot. That would be my stop. I was doing a pretty good pace; I did the first mile in 8:15 but I wasn't going to run another 25 minutes without a potty break. I honestly thought it would take me 30 seconds to do my business. When I got to the rest room I ran in and literally started counting down from 30. This was going to be my way of convincing myself that I wasn't losing a lot of time. 30, 29, 28...3, 2, 1... 1... 1... I kept peeing. I have absolutely no idea where all of this liquid was coming from but I was standing there for a really long time. Based on the time lost, if I didn't stop I would have set a run PR for the course. But had I not stopped I might have had other issues. So I can't regret stopping. It's all part of the race and when you gotta go, you gotta go. 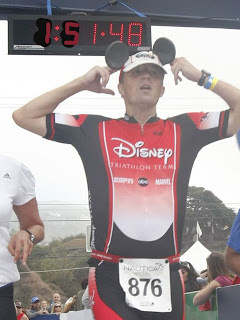 Here's the other big issue I struggled with: every year, I attach Mickey Mouse ears to my bike helmet and run cap. People love clapping for the Mouse so it is a good way for to get some cheap support from the crowd. But for reason, the ears weren't standing up on my cap very well. I kept trying to bend them forward but they just kept flopping on down again. When I reached the finishing chute, I literally ran through with my hands on my hat to hold the ears up in position. Not exactly the most dignified way to finish a race. 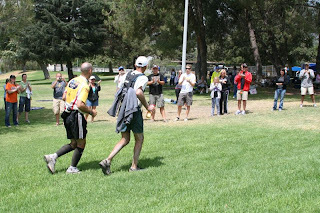 Our buddy Konrad was the race announcer, so when he saw me coming in he gave a huge shout out to neoprenewedgie.com. Konrad is awesome, and not just because he gives us special treatment at the finish line. He reaches out to the crowd and supporters a lot and keeps up the enthusiasm for hours. As for Jon Coward? He was a no-show. I don't know if my arch-nemesis Jon Cryer is doing the race again. I beat him my first year, but he defeated me the next four. 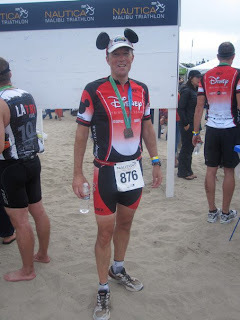 Last year, Malibu was on the same day as Ironman Wisconsin so I had to skip it. And since he knew I wasn't there for him to humiliate, he dropped out of the race as well. Don't think I've forgotten, Cryer... this isn't over. Oh and go team disney. I have not worn my wetsuit since Ironman Wisconsin, almost exactly one year ago. This upcoming weekend is the Nautica Malibu Triathlon, and since the water is currently 59 degrees I thought it would be a good idea to make sure my wetsuit still fit. I also wanted to remember what it was like to swim in a wetsuit. I planned on hitting the beach for Labor Day. Now as you may recall, I got a 4-inch tear in my wetsuit the morning of Wisconsin. And in the back of my mind for the past year, I've thought "I should fix that." Well of course I never did. So Monday morning I threw a bunch of safety pins into my wetsuit and was on my way. 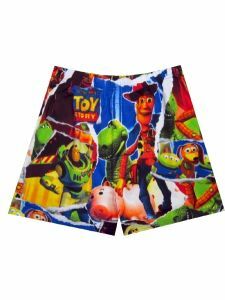 I wasn't trying to make the suit waterproof, I just wanted to prevent the tear from spreading any farther. Well, it wasn't my brightest idea. I drove to the beach, put on the wetsuit and headed towards the water. While walking along the sand, one of the pins came undone and started poking me in the back with every step. Ouch. I pulled that pin out and just hoped the others would stay in place. It was an odd day at the beach. There was a surfing section which was packed, and the swim area was pretty much empty. Surfers and triathletes don't usually mix well, so I kind of went alone in the swim section. Now then, it's not a good idea to swim by yourself, so I pretty much never went out over my head, which meant I was constantly in the surfline. Basically, I probably did a total of 10 strokes and the rest of the time just stood there shivering in the water. I have some neoprene cement so I finally patched up the tear but I have no idea if it will hold or not. I won't know until race day. I'll probably slap some duct tape over it for extra strength. I assume the wetsuit swimming will just come back to me (it's not a long swim), but the one thing I know for sure is that I'm going to be cold. 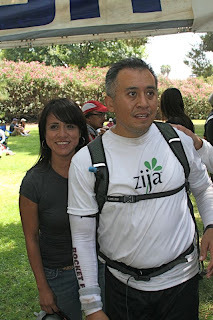 The finish line was in a small park in Altadena. If you were to drive by, you might think someone was having a family reunion barbecue; it had a very laid-back (hippie) vibe and was actually pretty nice. 116 people started the race and only 65 finished, so the finish line was not a hotbed of activity. I arrived around 10am, and once every 15-20 minutes another poor sap... errrr, finisher.... would come staggering in. As soon as anyone saw a finisher enter the park everyone would stand and applaud to bring him/her home. It was probably only 200 yards from the entrance of the park to the finish line, but it was uphill and these people had just run 100 miles. In other words, it was a very long and slow finish chute for everyone. Rich was the first of our guys to make it home around 12:45, and the first thing I realized was that the Disney & Friends Support Crew was by far the largest group at the finish line. We must have had at least 20 people in our group. That's right, WE rock. Rich was all smiles coming into the park. On the other side of the finish line however, I think the emotion of the weekend got to him a bit. It was nice to see. For those who don't know Rich, this sums him up perfectly to me: one of his former students was there and congratulated him on his race, not two minutes after the finish. Without missing a beat, Rich congratulated the student for the work he was doing on the track team this year. If EVER there was a moment that belonged to Rich, this was it. But nope, he has to go and make it about someone else. That's Rich. There was a computer station at the finish line and we were tracking Jesus and Gil. The computer predicted that they would finish around 2:15- AFTER the 2:00 cut-off time for the race. (For a hippie race, they had some impressive technology.) But what WE knew, and what the computer didn't, is that Gerald and Heather were pacing them for the last 26 miles. If anyone could bring them home in time, Gerald and Heather could. Sure enough, around 1:50 we saw Jesus. 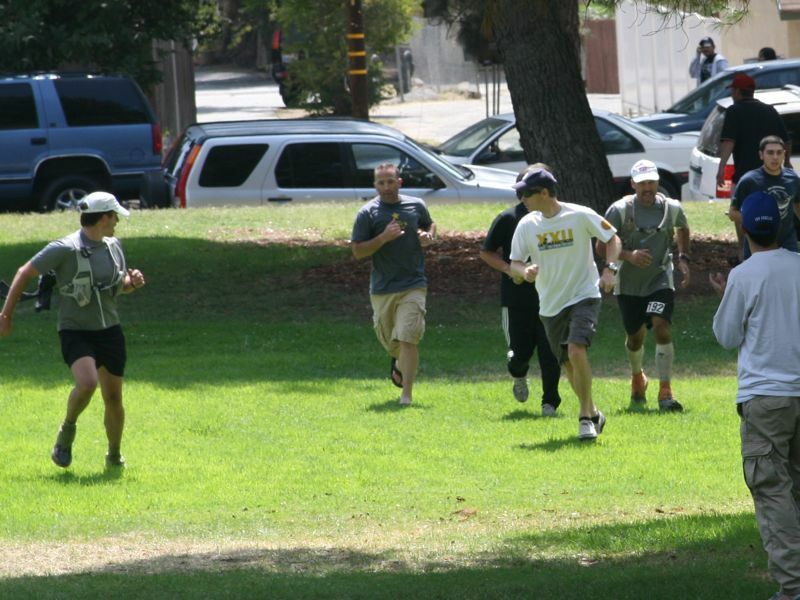 It seems that he and Gil ran about 98 miles together, but then Jesus pulled ahead for the final few miles. He ran across the finish line and kept saying "Heather... she saved me... never would have made it without her..." We knew he was in good hands. But truth be told, I'm not sure he did the entire course: the way he was walking around afterwards you would have thought he just did a 10k. He made it look easy. Then it was Gil's turn. Gil, Gil, Gil... always the showman. We first saw Gil coming down the street about 1:58. This was going to be close, and everyone knew it. The entire park was screaming at him to make it by 2:00. He tore up the grass (as much as someone who just ran 100 miles can tear up anything) and literally collapsed on the ground after crossing the finish line. He kept asking "did I make it? Did I make it?" Actually, EVERYBODY was asking it: "Did he make it?! Where's the race official?!" IN fact, several hours earlier the race gurus had already picked Gil as being the POSSIBLE final finisher and were tracking him closely to see if he would make it or not. Well the official timer checked him in at 1:59:43pm. What was the rush? After 33 hours of running, he had 17 seconds to spare. And while Jesus had nothing but god things to say about Heather, Gil did nothing but curse Gerald's name: "He lied to me! He kept telling me it was only another quarter-mile... and he knew it wasn't!" Sneaky Gerald...lying to Gil to make him run faster and beat the cut-off time. Like I said, we knew they were in good hands. We hung out in the park for another hour or so, giggling at the racers as we watched them try to sit or stand up again. Although considering what they had been through, they actually looked pretty good. Mostly. So overall, just an amazing weekend and it still blows my mind what they've accomplished. I'm even amazed just to know people like this. After watching the race, have I been bitten by the ultra-marathon bug? Nope, not even in the slightest. These guys are my friends and I think they're awesome, but they're freaking insane.